Nowhere in Tanzania is the potential for sustainable development of agriculture greater than in the southern region due to its good soil and rainfall, amongst other things. 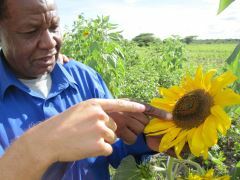 The subsectors maize, honey and sunflower have the highest potential for economic growth and deliver at the same time social and environmental benefits. The Southern region boasts many areas of good soils and sufficient rainfall. In addition it has access to regional, domestic and international markets and is home to around 9 million people. Altogether, great growth potential for sustainable agricultural development. Maize is the agricultural subsector with the highest growth potential since the local, regional and global demand for maize increases substantial. Maize is one of the most important cereal crops in Tanzania. It is the main staple food for Tanzanians and contributes significantly to income for lots of households. A substantial number of women and youth are employed in milling and aggregation activities. Tanzania is the maize basket for the region. The crop is still grown mainly by smallholders and medium-scale farmers, using traditional techniques. Resulting in yields, which are significantly lower than the potential for this land. To ensure a sustainable maize production, famers can plant different kind of crops together or in a yearly rotation. For example leguminous crops like beans or peas can be sown in-between the seasons of maize. This way it restores the fertility of the soil and keeps disease organisms and insects at low levels. Bees are probably not the first idea that comes to mind when you think of economic development and reducing poverty. Yet these little insects are causing a buzz by helping thousands of farmers in Tanzania. Local and regional demand for honey and other bee products constantly exceeds supply and good quality honey is becoming a valuable commodity. Till now, challenges of infrastructure, knowledge and capital have left many locals to consider beekeeping is not a commercial business. One of the biggest challenges of honey production in Tanzania is the traditional method of harvesting, processing, storage and packaging. It results in low quality honey and low harvesting yields. To meet the growing demand, farmers need to develop their knowledge and technical skills and use appropriate technology. A growing number of smallholders are eager to start beekeeping. Good news, since the current country production is only 3,5% of its potential. Moreover, on-farm pollination by honeybees increases yields and enhances the quality of crops. Tanzania imports large volumes of edible oils due to unmet local demand. However, the production of sunflower oil is a competitive alternative. The local and regional market for sunflowers is still growing because of the rising consumer health awareness. Sunflowers produce healthy seeds, oils, and lecithin. Farmers face various challenges mainly concerning the quality and production level of sunflowers. Due to insufficient knowledge and technologies most of the farmers do not undertake proper land preparation, planting and weeding. They also do not use quality seeds. Instead they use recycled seeds or traditional seeds from other farmers. At the moment the number of adequate processing machines increases since farmers in the southern region have now access to electricity. To protect the environment farmers should use more organic fertilizers and pesticides rather than chemical fertilizers. Organic fertilizers improve and sustain the soil and increase the quality of the crop, paving the way for sustainable agriculture. This economic opportunity research is carried out by Match Maker Associates in 2014.